Fan Friday Giveaway: Win Your Favorite Mask! What’s your favorite Mask? Would you like to win it? We’re so excited to bring you this week’s #fanfriday giveaway! Go ahead and comment on this blog to enter to win. And while you’re here, check out this week’s Blog Highlights! 1. Fashion inspiration from your favorite 90s movies. *Contest runs from September 6-8, 2013 and ends the morning of September 9, 2013, when the winner will be announced via Facebook and contacted privately. As a long-time writer, editor, and esthetician, I’ve had an ongoing love affair with Mario Badescu Skin Care for years. I can usually be found reading, knitting, painting, trying new beauty and skin care products, and telling everyone to wear more sunscreen. These days, I’m feeling super grateful for the opportunity to share more Mario with the world! I believe that better skin care changes lives. For more about me, visit my Google+ Page. Love the whitening mask!! It makes my skin look and feel fantastic and I get so many compliments!!! I love the Healing and Soothing mask! It helps heal my sensitive flaky skin after my acne has gone! It repairs the damage! LOVE IT!!! I completely heart the Drying Mask! It helps to dry out my oily skin, while being super gentle. It’s a must have. I love the healing and soothing mask. It soothes the red bumps that I have and makes my skin feel moisturised! I love the Strawberry Tonic Mask. My face feels so refreshed after and it’s great for the pores, tightens them up. They all are soo great I cant decided on just one! I am obsessed with the Whitening Mask. It makes my skin look amazing and it smells soooooooo good. Love them all! So refreshing! I love the drying mask which greatly helps my oily skin. Haven’t tried any…but would love to! Strawberry tonic mask!! So hard to pick just one! Whitening mask or healing and soothing mask! Never used a mask, but would love to try the cucumber one! Flower and Tonic mask. Love how it shrinks pores!! I love the glow I get after I use the whitening mask and it smells fantastic! I go through a bottle every month because my boyfriend and I do one at least twice a week and I love when he asks me “is it time to do our masks” I giggle but it’s awesome that we both can enjoy your products! Thanks MB! My favorite is whitening mask!!!! The sulfur mask is awesome! I would’ve the Oran Tonic Mask! Thank you cor this chance! I love the whitening mask! It really works! The Special Mask for Oily Skin! I have long been a fan of the healing & soothing mask. Lately I’m loving the whitening mask!! It has made a huge difference in my skin. My favorite Mario Badescu Facial Mask is the ‘ENZYME REVITALIZING MASK’! It leaves my face literally feeling like it’s been brought back to life. It moisturizes, brightens and invigorates my face. It’s amazing! Love the whitening mask… works miracles on my skin… my husband used it once and now he is also a fan! I love the rose hips mask! It does wonders for my skin!! I love your SUPER COLLAGEN MASK! It’s my fave! Makes my skin smooth like silk!! I would be LOST without the drying mask!!! Overnight, it reduces or gets rid of any breakout I have. I feel like I am addicted! 😉 Mario Badescu products are a life saver! Drying Mask! Simply the best!!!!!!!! The flower & tonic mask is a dream come true! This mask is so soothing and refreshing! It’s like a breath of fresh air for my face! And when I take it off, my skin feels so smooth and soft! My favorite is the Azulene calming mask. I get irritated pores easily and this calms them right down and evens out my complexion with a nice relaxing feel. Any one would be great! I love the drying mask for sure, but most of all i love Mario Badescu products!!! I love the healing and soothing mask, super refreshing and gentle on my skin! Sounds like the Whitening Mask is the one I need to try. Great reviews! The Ginkgo Mask is my favorite. I use it twice a week to keep my skin hydrated. I leave it on overnight when my skin needs some extra tlc, and I wake up glowing! It is my favorite anti-aging product. I love the whitening mask!! The mask smells great and makes my skin look and feel great!! I have really enjoyed the Healing and Soothing Mask and it leaves my face feeling cool and refreshed. Helps with all the blackheads. The Cucumber Tonic Mask is my fave!! I really enjoy using the Strawberry Tonic Mask. It really clears the blackheads, especially paired with a pore strip after. I love the whitening mask! Makes my skin feel awesome!! I have been wanting to try these products. I haven’t yet but eventually I will. Look forward to it, they have such great reviews. The drying Mask is my fave!! I would like to win the Healing & Soothing Mask for my daughter. She is 18 and having problems with acne combined with very sensitive skin. This would be perfect for her. I actually haven’t used any of your masks yet, but the Healing and Soothing one sounds like something I could benefit from! I like the Enzyme Revitalizing Mask because it makes my skin look better. Love the Cucumber Tonic Mask. It wakes up my skin. I love the drying lotion & silver powder. It’s a working miracle! I have quite a few of Mario’s masks, but my all-time favourite would have to be the Whitening Mask. It does wonders for my skin and all I ever receive is compliments. And a little goes a long way! I haven’t used any of your masks yet but I would love to try the flower and tonic mask! I love the Whitening Mask! It helps keep my freckles at bay, softens my skin, cleanses/tightens my pores, and smells wonderful to boot! My favorite is the strawberry tonic mask – makes my face feel refreshed! I like using the Healing and Soothing mask on a Tuesday, and then the Whitening Mask on Friday or Saturday! Great combination and it insures that I don’t get too used to the products by switching on and off. l have not yet tried your face mask, but would love to. Heard you have great skin products. I just started using Mario Badescu products and absolutely love the healing mask! It’s so soothing especially after a break out has healed. Healing and soothing mask! Clay makes me break out but this mask doesn’t have enough to clog my pores and it instantly makes my face feel better when I use it!! I love all of your products, but if I have to choose just one it would be the Whitening mask. The Strawberry Tonic Mask leaves my skin feeling great and smells delicious! Hard to pick one, however currently I’m favoring the Whitening Mask. I look refreshed when I use it. My daughter gave me the whitening mask for my birthday and I just love it! I love the Enzyme Revitalizing Mask because it exfoliates my skin so well! I love the cucumber tonic mask! It’s great and makes me, and my skin feel beautiful! My favorite mask is the azulene calming mask. I get redness on my face sometimes and this smooths my skin. I also like to use it if I get sunburned on my face. I love the smell too. Never can go wrong with this mask. The strawberry tonic mad is my all time favorite! Love the rose hips mask! It’s the extra kick my face needs to feel refreshed! I haven’t tried a mask yet from MB. I have every other product under the sun!! I would love to try the drying mask! 🙂 enjoy your weekend everyone! The healing and soothing mask is definitely my favorite. The mask leaves my skin refreshed and must make me shine, because my husband always says I look radiant after I’ve used it! The Drying Mask is my absolute favorite, it helps to clear my acne prone skin super fast. It also helps keep my t-zone in check. Drying mask is my holy grail! It prevents my combination skin from having breakouts! It’s a MUST have! The drying mask works better than anything I’ve tried on my acne prone skin. I love the rose hips mask!! It makes my skin feel settled and and tight! I absolutely love my drying mask, but would love to try the healing and soothing mask! I love the drying mask!! Majority of my skin care line is filled with MB products! I lovr that this mask helps clear up my skin but also soothes it with chamolie. I have super sensitive skin and love it!!! I’ve loved all the masks I’ve tried so far, but the whitening mask is definitely my favorite! It has helped lighten my hyper pigmentation left by acne and smoothed my skin! Its not too harsh for my sensitive skin and doesn’t have a foul smell like bother whitening products I’ve tried! AZULENE CALMING MASK is my favorite. Flower & Tonic Mask is my fave. The Drying Mask because my oily skin responds well to sulfur. MB’s Whitening Mask has been a real hero in my collection. Between sun damage and hyperpigmentation from breakouts, the Whitening Mask has really improved my skin tone. My favorite mask is the Drying Mask! Definitely one of my must haves! The Healing and Soothing Mask is the best! It gives my sensitive skin a little pick-me-up after a long day and reduces blothiness after a breakout! I tried my friends whitening mask and really loved the way it made my skin look and feel! The strawberry tonic mask has always been my saviour. Congested skin has always been problematic but with the help of this mask, I see a huge improvement. As a bonus my skin feels fresh. I love all the masks they all leave my skin feeling amazing and smell so great but I would choose the Cucumber Tonic Mask I like the scent the most so far. i have used and loved the flower n tonic mask but am dying to try the whitening mask and the rose hips mask! 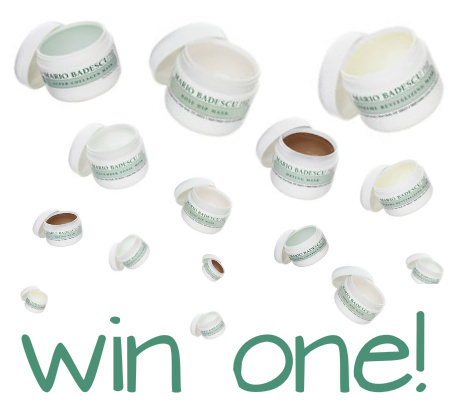 i’ve been dying to try the enzyme revitalizing mask, winning it would be an awesome gift! Heard a lot,but never tried,unfortunately.would like to try one! I love the special mask for oily skin. I have oily skin and hate when my pores become congested. I have tried so many different products for years..I would spend $30-60 on one product that didn’t even work.Tried the Mario Badescu line for oily skin and I’m hooked! This mask is by far my favorite.I use it along with the silver powder and its affordable for any budget! I love the Rose Hips mask! It soothes my skin and makes it look fresh and glowing! I love ALL of my MB product…My skin thanks you! I haven’t tried the masks yet, but I’ve had my eye on the flower + tonic mask for quite a while! I love the Cucumber Tonic Mask! Instant refreshment and it makes my skin look so clean and clear! Drying Mask for my 17 year old would be my favorite. However, today only ordering the Drying Lotion..Just wish there was discount codes. Question, the drying lotion separates, but the bottle says do not shake. How should it be blended?? I like the Orange Tonic Mask because it cleans pores!! Also, yay orange! Haven’t tried many of the masks yet. Strawberry tonic sounds intriguing, I’d love to try It! My favorite mask EVER is the Enzyme Revitalizing Mask! My skin always feels refreshed, moisturized and A-MA-ZING after 15 minutes with this mask. I continually recommend this to everyone I know who is looking for a facial pick-me-up and have yet to encounter a negative response. This is so hard, since I’m obsessed with several MB masks (strawberry, healing and soothing, drying). But if I HAVE to choose, it’d be the whitening mask. I just got a sample of it, and already I know I’m going to need a full-sized one! I’ve suffered from acne (and the redness/scars that come with it) since the 4the grade. Even with just one use of it, I can already see a reduction of the redness and feel 10x more confident sans makeup because of this product! I tried a sample of your Enzyme Revitalizing Mask and completely fell in love, I can’t even really explain how it helped, I just know my skin looked and felt different after I used it, the best kind of different! Like my skin was smoother and brighter. 🙂 So it would be really neat to win a full size, though I’ve also been curious about the Special Mask for Oily Skin, which I have never tried, but I have really oily skin, so it seems like it would be a good fit for me. Omg I would love to win one of your masks, I’m in love with Mario Badescu’s products. They make my skin feel great! I think the drying mask will control my very oily skin! My favorite mask – Super Collagen Mask! It’s pretty easy to spread on the skin. becomes firm, taut…. I’d like to win it so very very much! Favorite mask, drying cream, perfect for acne!!! My favorite is the Healing and Soothing Mask! It is perfect for my problematic, sensitive skin. I love the Drying Mask! I have used the Strawberry Tonic Mask and I was very impressed with it! All of your products I have used have all been the best i’ve tried. I love the strawberry tonic mask. My face feels wonderful after I use it. My favorite mask is the Drying Mask, it leaves my skin feeling free of grossness lying in my oily T-zone, puts my Origins active charcoal mask to shame. I want to try all of them. I used 3 masks. The drying mask and the healing and soothing mask. These two work great together. But my favourite is the strawberry tonic mask. It makes my pores look smaller and my blackheads are reduced. This mask is so great and refreshing. Calma mask is my weekly go to for fresh, clean skin. Enzyme revitalizing mask is great..
Whitening Mask is the best mask! I LOVE the enzyme revitalizing mask! I apply a little bit of the vitamin c serum before applying the mask and afterwards my face is GLOWING! Love glycolic acid toner…it has completely transformed my skin..my acne scars have faded and I have a more even skin tone. Would love to try some other Mario Badescu products. My favorite mask is the Super Collagen Mask. It makes my skin feel so hydrated and soft! Enzyme Revitalizing Mask is the best! I love the Healing and Soothing mask! I’m wearing the Flower and Tonic mask right now-just like I do every Sunday evening. It gets rid of my extra oil, shrinks my pores but doesn’t dry my skin excessively. The scent is light and refreshing. I love this mask! I would like to win the Healing and Soothing mask,it’s the best for my skin.Thanks for chance! the flower and tonic mask! I LOVE the Temporary Lifting Mask. It really makes my skin texture smooth, and makes my skin look youthful. I love the cucumber tonic mask! So refreshing at the end of the day! The Drying Mask is fantastic! I have acne prone skin and this make really helps with reducing oil on my skin and unclogging my pores. I’ve never tried out the masks but would love to try one that is soothing is moisturizing. I love the hydro moisturizer with vitamin c, the silver powder, and drying lotion. If I have to choose one fave, it would be the Whitening Mask, but I also love the Rose Hips Mask. What can I say, there are no bad MB products! My favorite is the Super Collagen Mask cause this old skin ain’t getting any younger and this mask is wonderful. Would love to try the Orange Tonic Mask! Been thinking of getting it, as it looks like it’s good for lots of skin types, so my daughter and I can share. It’s a tie between Enzyme Revitalizing and Super Collagen. I alternate between the two and love them both! It is really hard to choose, but I have to say that the drying mask really has helped my skin tremendously. I have very rosy skin so the azulene calming mask is my favorite. It’s very soothing! I love the whitening mask. With age, my pigmentation is changing and not for the better. It needs all the help it can get especially after the summer sun. Must I pick one? I suppose the healing and soothing one because my face is in need of it. I love, love, LOVE the Flower & Tonic Mask!! It smells incredible, it feels so incredibly soothing, and I can see a noticeable difference in my skin’s texture with one use. I haven’t tried all of the masks yet, but F&T is def on my must have list!!! Calma mask! Whenever my eczema breaks out from something I ate, I put this on my face and I then I dont wanna take it off! It just feels so cool and calming I LOVE IT! I absolutely love the Enzyme Revitalizing Mask! I love how the enzymes work to make my skin soft and supple. It’s the perfect pick-me-up when my face is feeling tired and dull. I am really into the drying mask right now! I love how it helps my blackheads and breakouts! The healing and soothing mask. It is the best for when I have a sunburn, or after I am healing from a pimple, or have a scratch or other blemish. Plus it just makes my skin feel good and glowing and healthy. Enzyme Revitalizing! i am not a big fan of ready masks but Enzyme Revitalizing! its the best product ever. my skin loves it. i feel like i spent half day for facial SPA! ROSE HIPS MASK is just the right one for Minnesota cold weathers! its my SOS. i always have it because my skin loves it. my skin is very happy to be perfectly moisturize… love it! Love the whitening mask! It diminishes acne marks and scars and also helps with my hyperpigmentation! Drying mask all the way! Gets rid of acne without leaving leaving my skin red and rashy like other acne products. Love, love, love the whitening mask!!! Wish I could use it more often!!! Cucumber Tonic Mask – great for my skin at the end of the day! The Azulene calming mask is a miracle in a bottle! Fantastic product for anyone with sensitive or acne-prone skin. The mask instantly reduces irrational and redness. The Azulene calming mask is a miracle in a bottle! Fantastic product for anyone with sensitive or acne-prone skin. The mask instantly reduces irritation and redness. I am in love with Drying Mask and drying cream, but huge fan of all Mario Badescu products. Nothing works better for me. Recently relocated from Texas to Virginia and my skin was very unhappy with the change ! The calming mask not only calmed my skin, but helped me stay calm through the chaos of moving. The Drying Mask is THE BEST! Don’t let the scent fool you. THIS STUFF WORKS! I used it on the HOTTEST day of the year in the Chicagoland area, and my face was not greasy/oily at all! I highly recommend this! Hmm…tough call but I think it’s between the strawberry and the whitening mask..love them both!! There are a few others I want to try (i.e. collagen, enzyme) but keep going back to these two. My favorite mask is the MB Calma Mask. I have very sensitive, rosacea-afflicted complexion and I cannot use many of the other products available on the market. The Calma mask rejuvenates my skin, while minimizing my pores and the fine, visible capillaries on my cheeks. My favorite mask is the Whitening Mask ! Q&A: Why Does My Skin Freak Out When I Fly? What's In Your Medicine Cabinet?